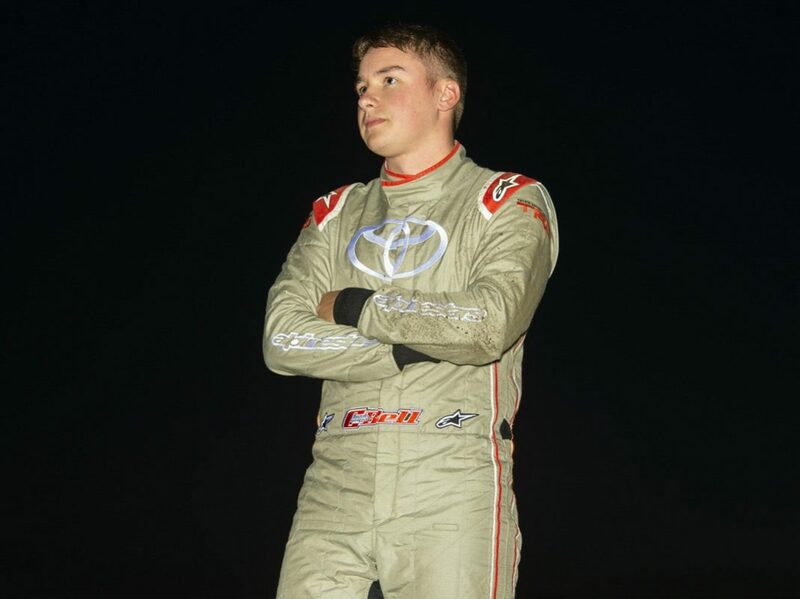 BARBERVILLE, Fla. – Christopher Bell landed on the podium during Friday night’s World of Outlaws NOS Energy Drink Sprint Car Series season opener at Volusia Speedway Park, but he wasn’t satisfied with that. Bell wanted more – specifically a victory – out of his ride with Swindell SpeedLab in the No. 39 entry. The Norman, Okla., native and NASCAR Xfinity Series regular lamented missing out on one of Volusia’s trademark Gator trophies during the third night of sprint car racing at the Volusia County facility, specifically because he felt he had the speed and all the right pieces to be the one parked in victory lane. “Overall, to run third with the Outlaws is nothing to complain about and I’m really happy about that, but I feel like we had a race car that was able to contend for the win … and I didn’t win,” said Bell. “I’m bummed about that, but I could make runs on the guys ahead of me and get there, which is really good. I’d just get blocked or whatever at the last minute, and lose momentum to where it wouldn’t work out. Bell’s most recent World of Outlaws victory came at Ohio’s Eldora Speedway in October of last year. – David Gravel garnered hard-charger honors Friday night by charging from 17th on the grid to finish sixth, but perhaps the biggest statistical anomaly was his deadlock with Donny Schatz at the finish line. Gravel and Schatz took the checkered flag in a dead tie on electronic timing and scoring at the end of the 30-lap feature, both exactly 6.657 seconds behind race winner Daryn Pittman. By World of Outlaws rule, Schatz was officially scored ahead of Gravel in fifth, as he was ahead on the previous lap. Schatz is seeking his 11th World of Outlaws championship this season in the No. 15. 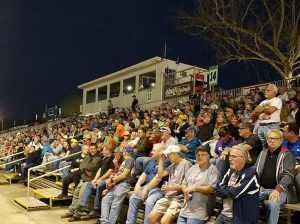 – Friday night’s DIRTcar Nationals program at Volusia featured the largest Friday crowd in event history, with a visible wall-to-wall crowd treated to thrilling action all around the half-mile dirt oval. Longtime World of Outlaws announcer Johnny Gibson made the announcement just after the Last Chance Showdown Friday night, warning fans to be patient as they left the facility later on. The crowd was eventually brought to its feet by a thrilling battle between Bell, Shane Stewart and Pittman, all three of whom are driving for new teams this year. 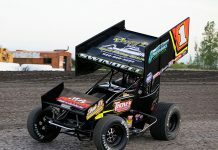 – Notably, the podium of Pittman, Stewart and Bell marked the first time in the 41-year history of the World of Outlaws that Oklahoma natives swept the top three finishing positions in a series feature. It was a stunning performance by the Sooner State, which saw Pittman hoist the Outlaw championship for the only time in his career back in 2013, driving for Kasey Kahne Racing at the time. – Speaking of Kasey Kahne Racing, the team namesake was one of three big names who failed to transfer into Friday night’s A-Main after missing the cut in the 12-lap Last Chance Showdown. Kahne finished fifth, one spot out of a direct transfer, meaning that he and his No. 9 Wicked Energy Gum team were forced to watch the main event from the sidelines. World of Outlaws regulars Sheldon Haudenschild and Brent Marks also finished outside the top four in the Last Chance Showdown, but as platinum drivers, were able to start the feature on provisionals. Haudenschild finished 18th and Marks was 22nd when the checkered flag waved. – With finishes of second, second and first in the first three nights of sprint week at the DIRTcar Nationals, Pittman currently leads the chase for the Big Gator trophy that will be awarded on Sunday night. Pittman, who last won the Big Gator in 2015, sits 14 points ahead of Stewart in second.